I have this terrible habit of assuming that workouts without barbells are not going to be so bad. Maybe because I am naturally fearful of the barbell and its unfamiliarity, but often the ones that hurt the worst are the ones like Murph, or 8 rounds of sprints, or pretty much any bodyweight movement – push-ups never get any easier. So I’m not sure why this EMOM at CrossFit Mousetrap took me by surprise! It’s no wonder it call itself the Fittest Place on Earth! with this kind of programming! 😉 Fortunately for Jason and I, the coach made the very sensible decision to cut the EMOM to half the time given that we still had a second wod to get done too. *Score is your lowest scoring round of burpees. Make sure you comment below with your scores! Roz’s lowest scoring round was 16 burpees. Roxy and Coach Randy, representing Own Your Eating with our awesome tees! We had such a great time hanging out with these two that we left and came back! Let that be a warning to any of you Tribe members who unsuspectingly welcome us into your homes 😉 I mean, what do you expect when you make cinnamon toast crunch cookies and have taco Tuesday every night of the week?! Of course it also helped that they lived around the corner from an AMAZING patisserie The French Cafe. There’s nothing quite like custard-filled, sugar-glazed cronut to get you hyped up before a midday wod. 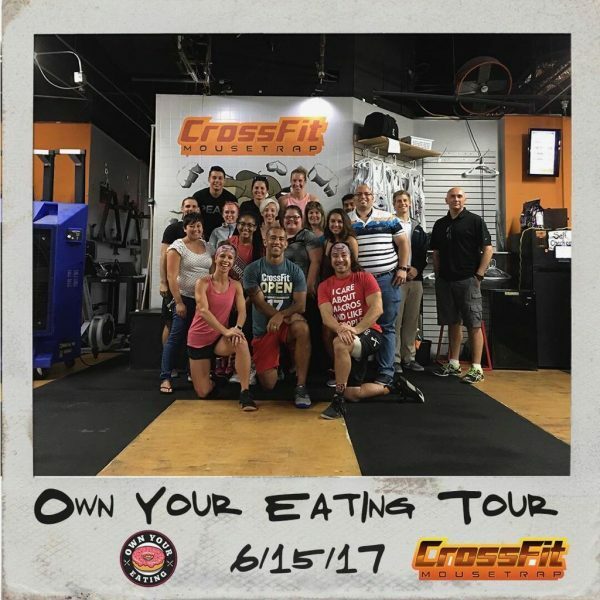 Check out our short little video of our time at CrossFit MouseTrap which included a 2-hour nutrition seminar on flexible eating. If you’re interested in having us deliver a seminar at your box then please reach out to us via the “Host Seminar” page on our site.